Charmaine's Pastry Blog: Where's Pablo? Posted by Charmaine at 5:06 p.m.
We have the same Hermé favourites! I think I could kill for a plaisir sucré! August 26, 2008 at 7:32 a.m.
August 26, 2008 at 3:22 p.m. I love sanrio characters, and I also have a bunch of old pencils, notebooks, stickers and other knick knacks from my childhood. August 26, 2008 at 6:08 p.m. Loved Hello Kitty and love these cupcakes; you're right, seeing the massive repetition of pattern is really striking. Well done! August 27, 2008 at 8:16 a.m.
August 27, 2008 at 9:01 a.m.
August 27, 2008 at 3:27 p.m.
Yikes..those looks super cute and yummy! August 27, 2008 at 8:31 p.m.
Don't know Pablo, but I love him and his little hat with the propeller.. too too cute! August 28, 2008 at 4:04 a.m. 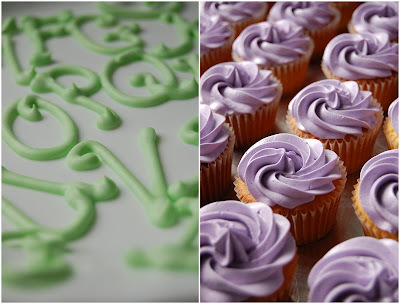 I love the lavender colour of the icing on the cupcakes. Very striking! September 3, 2008 at 8:21 a.m. I'm planning to write a post on what I consider to be the most original August food photos. I will be posting the 10 photos on Culinarty (my blog) with a link back to the authors. This is actually the fourth edition of "10 Original Food Photos". I really like your first photo (who doesn't love Pablo right?) and I would very much like to include it in my post. Would that be ok with you? September 16, 2008 at 11:00 a.m.